Our remarkable range of ThermBright Thermal targets for Infantry are fulfilling a number of urgent operational requirements for the British Army and many other customers worldwide. ThermBright Thermal targets are made from advanced materials, have natural thermal contrast properties and are completely unpowered, as they work on the principle of reflected energy from space. Compared to traditional heated targets, which are ineffective against thermal imagers, ThermBright targets have proven to take ten times the amount of hits before degradation. Our Passive Thermal Targets will work day and night, in overcast conditions, in rain or snow, and can also be easily patched up in the field to repair and reuse. 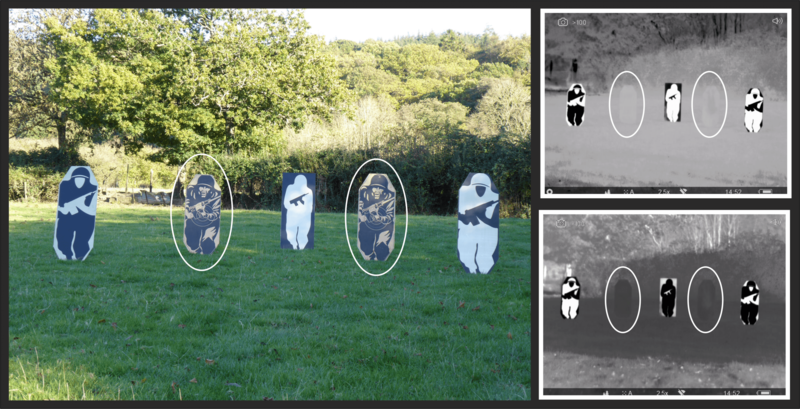 ThermBright Thermal targets are the most efficient and cost-effective choice for target training. 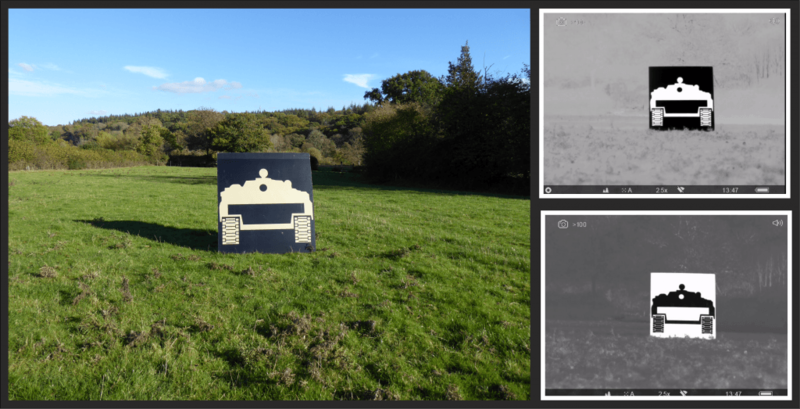 ThermBright Thermal targets for Infantry can satisfy the clear requirement for thermal targets to support the training and development of combat forces, as they can be used for both day-time and night-time training. The versatility of the ThermBright range of targets means they can be used for all types of surveillance and target acquisition (STA) systems including image intensifiers and thermal imagers. ThermBright is the simplest and most cost-effective way of providing thermal targets for weaponry using thermal or fusion sights. 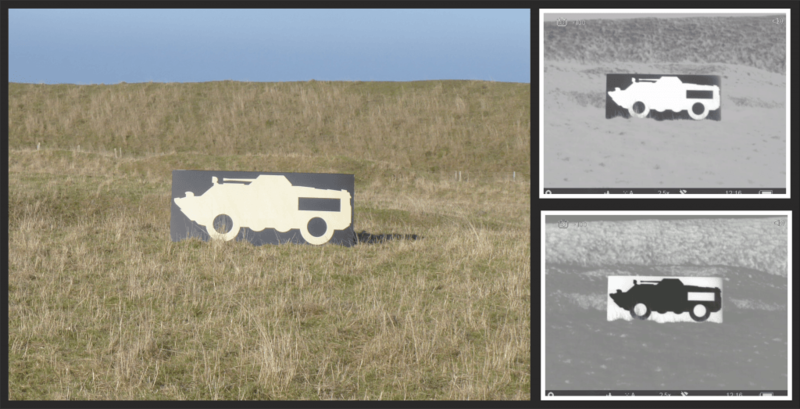 The targets can be manufactured in most shapes and sizes including photo-realistic thermal targets (PRTT). 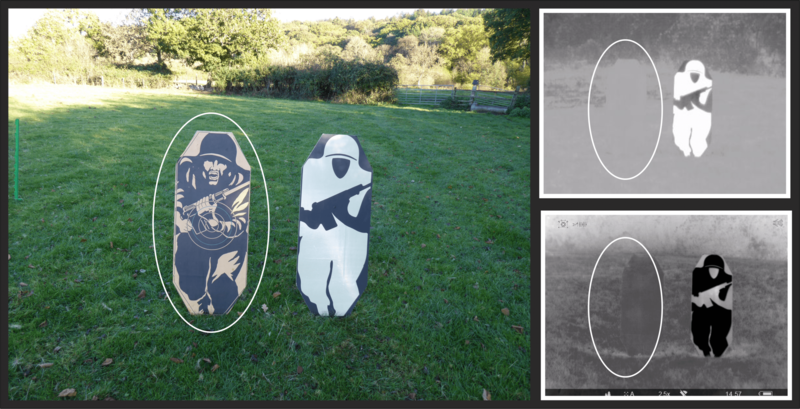 The main benefit of the ThermBright range of UNPOWERED targets is that they can be used anywhere without base facilities. The targets work night and day and during full cloud cover. They also have natural thermal contrast properties, this means that they reflect the cold energy of space, meaning the position or appearance of the sun is irrelevant. All thermal targets are available in normal and reverse polarities, and we have a small range of PRTT (photo-realistic) targets (see below). ThermBright Fig 11 vs Conventional Fig11 , normal and thermal, standard and reverse polarity views. Note – the conventional brown targets are invisible in thermal view. 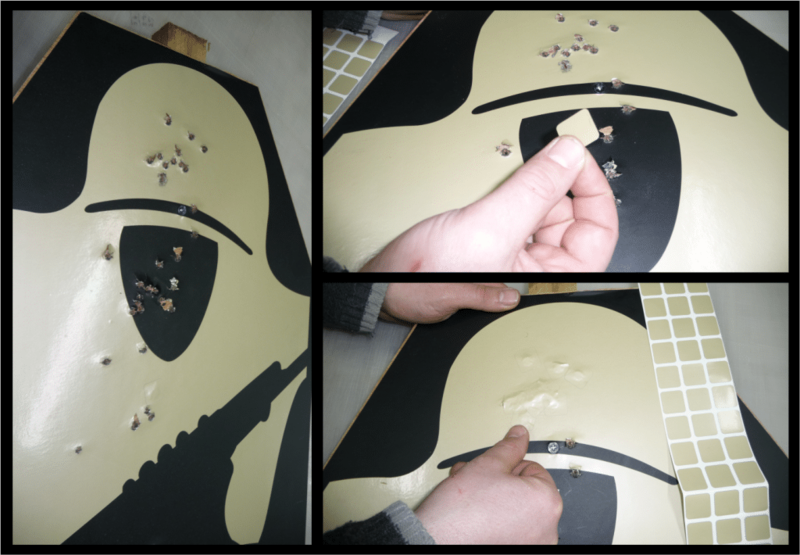 ThermBright targets can be any size or shape and can be a simple self-adhesive target or a PVC backed target mounted on a fluted polypropylene, plywood, metal or plastic surface. Thermbright targets work day and night and in inclement weather conditions, as has been proven during testing undergone world-wide in countries as diverse as Iraq, Afghanistan, Norway, Alaska and Australia. During recent testing ThermBright Thermal targets were shown to work effectively from -20 to +40 degrees centigrade. Heat seeking missiles such as Javelin WILL make a thermal “lock-on” against Thermbright unpowered passive thermal targets. A common feature to all ThermBright Targets is that they can be repaired and reused by the use of ThermBright Repair Patches, which are available in sizes for both small arms and tank fire. ThermBright targets are supplied in rolls making shipping and storage an easy process. ThermBright Thermal targets can be made in any size or shape subject to our customer’s requirements, including PRTT and 3D thermal targets. The targets can be set up hours, days or even weeks ahead of the exercise. Thermal identification features can be easily added to ensure any battlefield scenario can be catered for. PVC backing is recommended for large targets such as tanks and this type has built in eyelets to allow the ThermBright target to be draped over the original target backer. ThermBright Thermal Tank targets can be ThermBright blocks, simple outlines, detailed outlines, 3D targets or photo-realistic targets (PRTT). 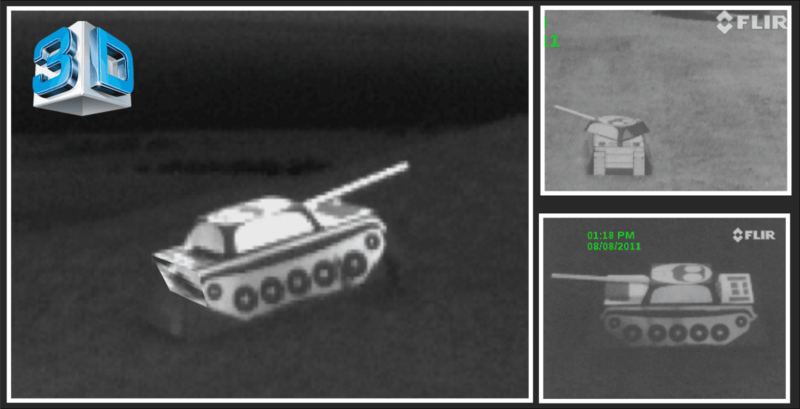 Armoured vehicle targets, normal and thermal views. 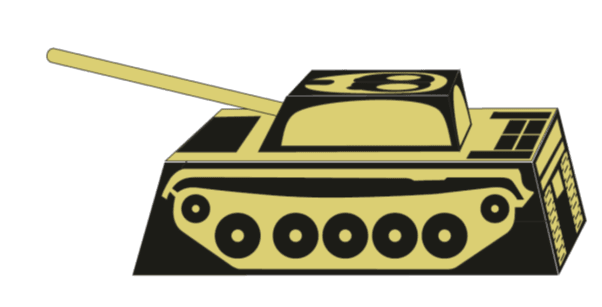 The illustration shows a PRTT Tank Target. Visible and normal and reverse polarity thermal views.